I just voted for this book in the Goodreads Best Books of 2013 contest, and I hope it gets a piece of the prize. Unlike some series, the Kate Daniels urban fantasy series gets better with each book. This is the sixth book in (seven if you count Gunmetal Magic, set in the same world but focusing on another character, Kate's best friend Andrea), and the quality has not fallen off one bit. On the contrary, the storyline is tightening and the characterizations deepening as we march towards Kate's inevitable confrontation with her father, the all-around Big Bad and Nasty, Roland. 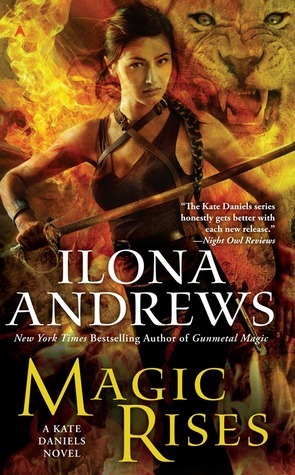 This storyline takes a bit of a side trip, focusing on a crisis not directly related to the main story, but the authors (a husband-and-wife team writing under the pseudonym Ilona Andrews) tie it back to the main Big Bad quite cleverly. The dastardly Roland has yet to make an appearance in any of the books, but he's been built up so well I can hardly wait. This book makes it clear that Roland's deadly train is rolling down the tracks, headed straight for Kate and her loved ones--and we still don't know if she has the power it will take to survive. Besides this building tension, Kate and her mate Curran's characters are well rounded in this book, along with the various secondary characters. Curran gets a lesson he hopefully won't forget about not trusting Kate and leaving her out of his schemes, and Kate fully embraces her role in the Pack, Curran's conglomeration of shapeshifters. As always, the world is fascinating--a post-apocalyptic clash of technology and magic, with the latter slowly winning. This book, basically, is what I wish Yasmine Galenorn's Otherworld series could be. (I'm still not over that profound disappointment.) I'm chomping at the bit for the next book. Sign into Goodreads to see if any of your friends have read Magic Rises.